About the group This project group visited and photographed Durham's World Heritage Centre as it is today. 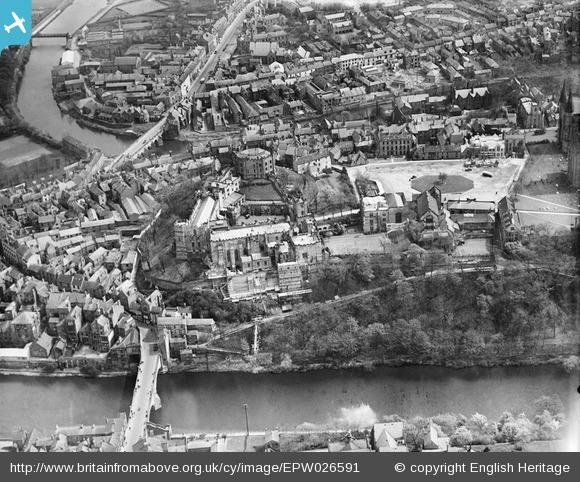 Durham Pathways History Group have been studying the Britain from Above photographs of the World Heritage Site in Durham. 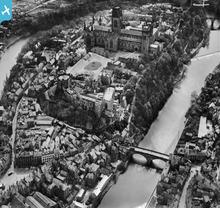 They have photographed the buildings on Palace Green as they are today, including the Cathedral and the Castle. The group has found out about all the buildings on Palace Green, when they were first built, what they are used for today, and what they have been used for in the past. Here are our photos and some information about each building. We have arranged the photos of the buildings in date order, starting with the oldest buildings. 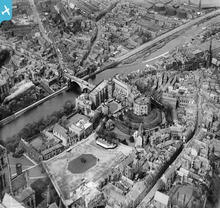 We have also added some of the Britain From Above pictures showing the buildings. Can you spot them? 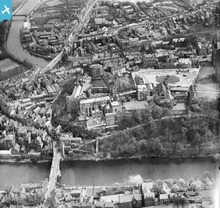 In the 1070s the building of Durham Castle was started. From the top of the castle the Bishop could see everyone coming and going from Durham. In the 14th century it would have been hard for enemies to take over the castle. First attackers would have had to cross the River Wear. Then they would have had to get up the rocky riverbanks, and then they would have to get over the City Wall, before they got to the castle. 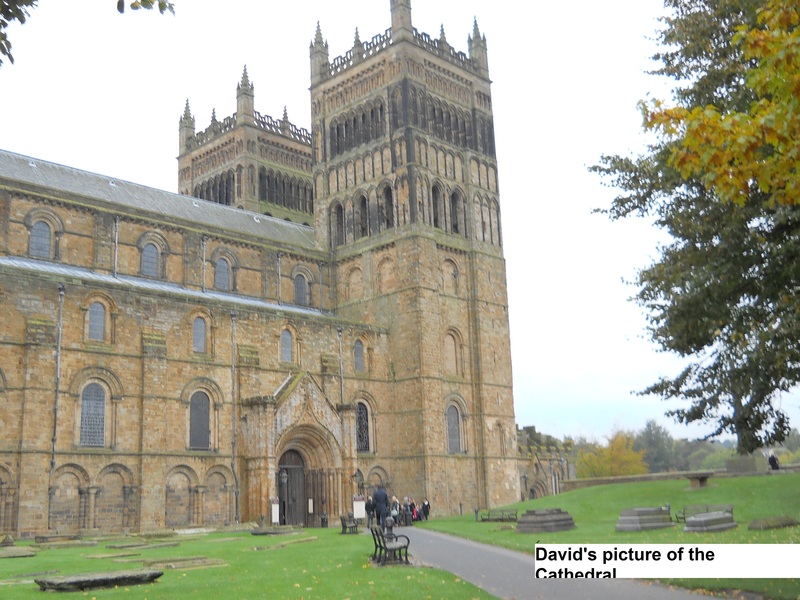 Between 1093 and 1133 Durham Cathedral was built. The monks had brought the body of St Cuthbert to Durham in 995. The Cathedral was probably built here because the site was on a hill, surrounded by the River Wear. The Castle would help to protect the Cathedral. This is David’s picture of Durham Cathedral. The Bishop’s Exchequer was built in 1450. The Bishop of Durham was very rich because he had so much land. In the Exchequer, the accounts were kept of the money which the Bishop got from his lands and his rights. In medieval times, he could claim stray horses, and even whales washed up on the coast of County Durham. Today the Exchequer building is part of Durham University Library. This is Nina’s picture of the old Exchequer. The Grammar School was first built in the 16th Century. The old Grammar School was only for boys. Today the Grammar School is part of the University Department of music. This is Richard’s picture of the old Grammar School. This picture shows the old Alms Houses, built 1666, and also Cosin Library, built 1669. The Alms houses were built in 1666. The Alms houses were built for old people to live in. 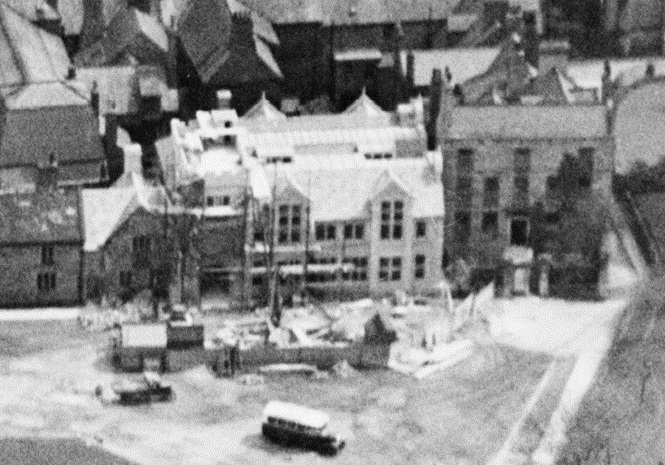 When the university wanted to the use the building, the old people moved to new Alms houses around the corner in Owengate (or Queen Street as it was called then). The building is now a café. This is Sandra’s picture of the doorway into the old Alms houses. Bishop Cosin had this library built. He gave his own books to the library and they are still there today. This building became the first university library. This building is called Cosin's Hall, built in the 1690s. It was used to put up the students in the early days of the university. Before this it was known as the Archdeacon’s Inn. Today it is still used by the university. This is Christine's picture of Cosin Hall. 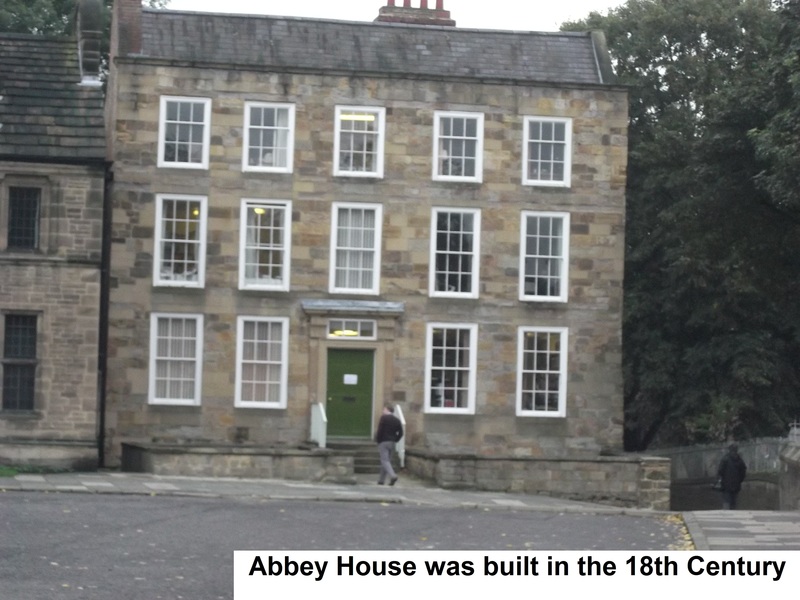 Abbey House was used as a residence for female university students from 1899 until the 20th century. Before this it was used by a solicitor as his house and office. In 1851 Robert Burrell lived here with his sisters and servants. It is now the university Theology Department. Su's picture of Abbey House. 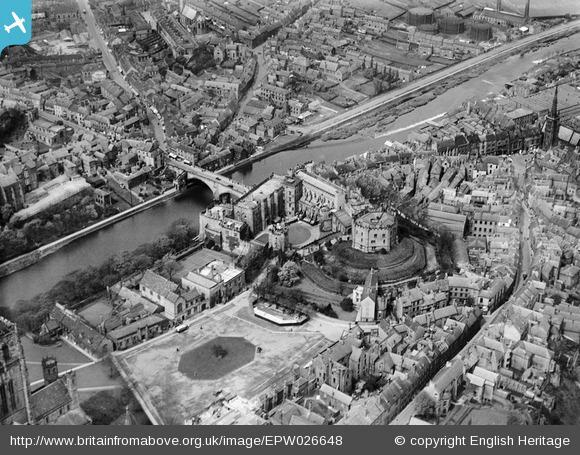 Abbey House can be seen on this picture, at the right hand side of the green, near the Cathedral. In 1820 the Diocesan Registry was built. The registry was where people took wills to get probate. On this site there used to be a court house called the County House. 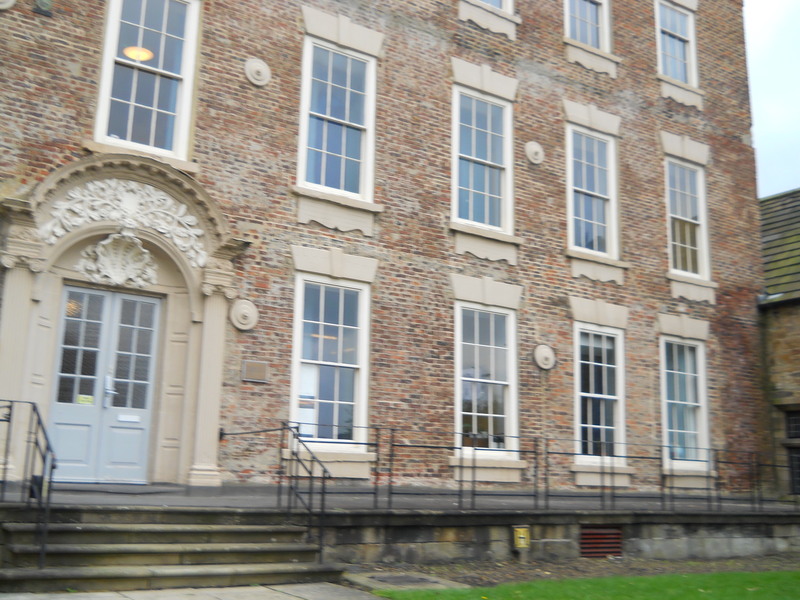 Legal cases were tried here until the new court was built in Elvet. This is Gloria's photo of the Diocesan Registry building. The Registry building is shown on this picture in 1929. By then it was used by the university. The Bishop got some new stables designed by Anthony Salvin in 1841. They are now used as public toilets. 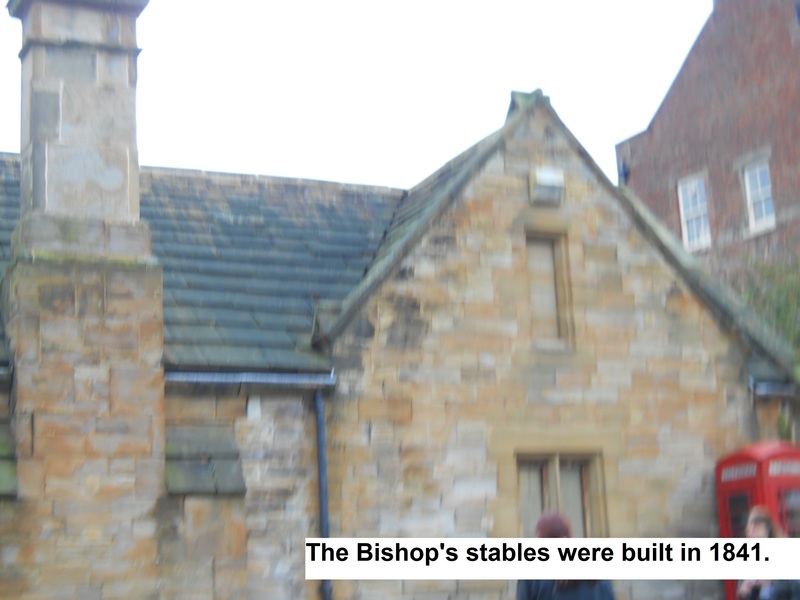 Christine's picture of the Bishop's stables. The Bishop's stables building can be seen on this photo in 1929. In 1882 Palace Green library was built for the university students. It is where the Bishop's stables used to be. The front of the building has been turned into a gallery and museum, run by the university. This is Gloria's picture of the doorway to the University Library. Dorothy's picture of the Pemberton Lecture Rooms. Nina’s picture of the doorway to the Pemberton Lecture Rooms. 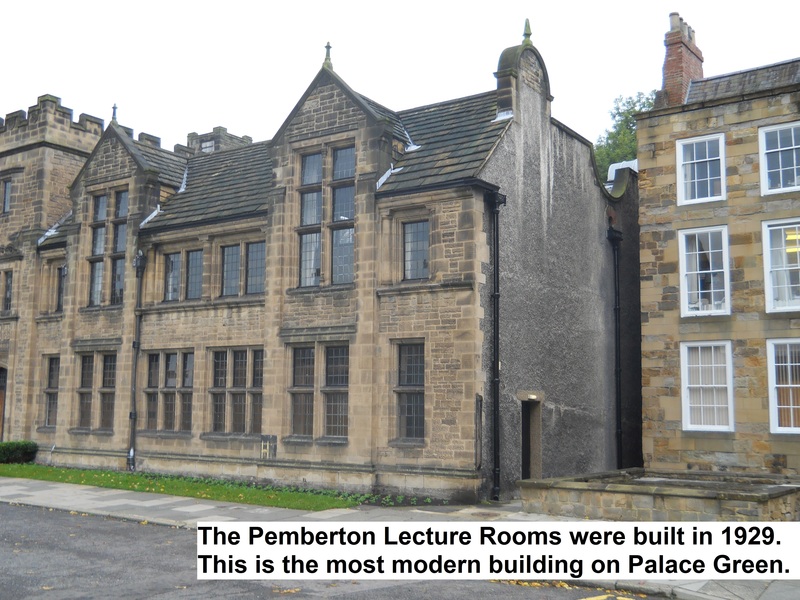 The Pemberton Lecture Rooms were built for the University in 1929. 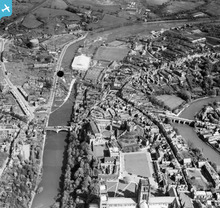 We can see them being built on this Britain From Above picture, taken in 1929. They are putting the roof on, and there are builders’ waggons outside. Sandra’s picture of Palace Green. David’s picture of Palace Green. The grass covers a much bigger area than it did in 1929. This picture shows some of the buildings we photographed. It shows the Castle, the Bishop’s stables, Cosin Hall, The Almshouses, the Pemberton Lecture Rooms, Abbey House, and the backs of the buildings on the opposite side of Palace Green. Palace Green is a World Heritage Site because there are so many interesting historic buildings there. This picture shows buildings we photographed. 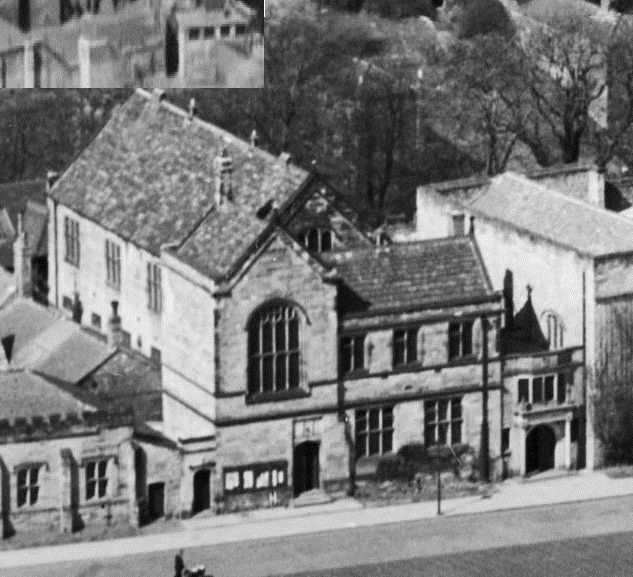 It shows the Cathedral, the old Grammar School, the Diocesan Registry, Palace Green Library, Cosin’s Library, the Exchequer and the Castle, and the backs of the buildings on the opposite side of Palace Green.